Fight like San! A badass girl raised by the wolf goddess. Make your love for Princess Mononoke known when your sport this empowering t-shirt design. 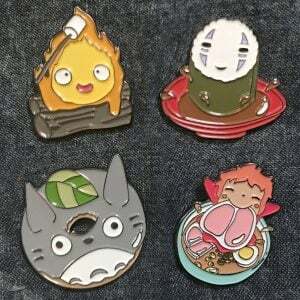 Makes the perfect gift for any woman who’s a fan of the Studio Ghibli film. Deku gets teased a lot, but that doesn't stop him from being a hero! Inspired by his favorite super hero, Deku is often seen wearing this All Might fan t-shirt. Fantastic tee for a subtle cosplay that you can wear everyday! The Sailor Scouts are here to help remodel your sock drawer in the name of the moon! Each of these 6 pairs of cotton socks will transform your feet into a cute and stylish Sailor Scout. They go well with any outfit and are perfect for everyday wear! Can you identify all the Pokemon eggs in this poster? This unique, heavy cardstock poster displays twenty two different eggs belonging to classic first generation. The perfect gift for lovers of Pokemon, fantasy art, and biology. Studio Ghibli has created a superb replica of the Levistone inspired by Castle in the Sky. This amulet will not only recognize your voice and glow, but place it on the Soldier music box and it will glow while the Robot Soldier ornament’s eyes light up.